When it comes to selecting and designing a belt conveyor system one of the key decisions made is the belt type and when to use that particular type. There are two main types of belt conveyors used in municipal water and waste water applications; trough belt conveyors and sidewall belt conveyors. When it comes to choosing between these two belt types it does not come down to only application but the design of the belt conveyor itself that will drive the choice. Want to learn more about belt conveyors? Watch this recent JMS presentation. 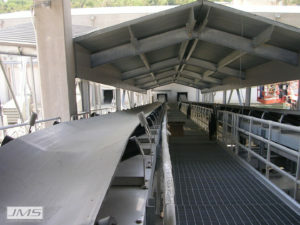 A trough (or troughing) belt conveyor is the most common type of conveyor and most cost effective. It uses a flat belt that is formed into a trough shape by top carry idlers that will more effectively hold product. The troughed carry idlers have a center horizontal roller and two out board rollers that are angled at 20o. Flat carry side belt conveyors are possible and can be utilized in case of height restrictions that would prohibit a troughing belt idler, but a troughing profile is preferred to better cradle product. The belt flattens as it nears and rounds the head pulley, discharges product and then allows one or more wipers to clean the flat belt. Return idlers on the bottom of the conveyor are either solid or disc type cleaning rollers, both are flat. Trough belts are typically one plane: either horizontal or incline up to 25o. They also do have the ability to incorporate a radius in the conveyor frame to transition from horizontal to a gently sloping curve to gain elevation. A trough belt frame must have a radius of 125′ or greater. Any radius smaller than 125’ risks having the belt lifting up off the idlers because of belt tension. A belt may be radiused in either direction, convex or concave to the floor (or both). A trough belt can have multiple drop points with the use of belt plows. This can be done when a troughed belt transfers to a flat belt and uses belt plows to wipe product off the belt side at a given discharge point(s). This type of belt conveyor is ideal for longer applications and where preserving the product integrity is important. Troughing belts are a very cost-effective and the preferred material handling belt conveyor solution. A Sidewall belt conveyor uses a flat belt on flat carry idlers. The flat belt utilizes hot vulcanized corrugated sidewalls to contain product. The corrugations allow the sidewalls to bend at transition points and still hold product. A sidewall belt conveyor also has a flat tangent outboard of each sidewall to provide rollers a hold down point during transition points. The cumulative tangent and corrugation widths have to be subtracted from overall belt width to obtain usable cross-sectional area when selecting a sidewall belt width. When a sidewall belt conveyor reaches an incline greater than 30o cleats are required across the belt width to prevent product rollback. Cleat heights and centers depend on product, volumetric capacity, and incline degrees. A disadvantage to cleats is that a belt wiper cannot be used and the product has to be tapped out of the belt by a belt thumper as is it rounds the drive pulley. Keeping the sidewall incline at =<25o will result in a cleaner belt system. A sidewall can only have one drop point, at the end. It cannot have multiple drop points as can a troughing or flat (non-sidewall) belt. 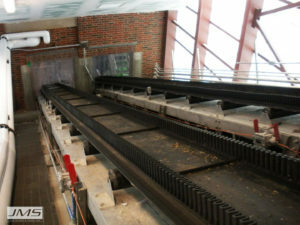 Sidewall belt conveyors is are used mainly in tighter applications or one needing multiple planes. A sidewall can start horizontal, transition to incline and return to horizontal again. Only one drive unit is required for all planes on a sidewall belt, giving it an advantage over multiple drive systems. The sidewall belting itself is more expensive than a troughing belt so these trade offs should be considered.